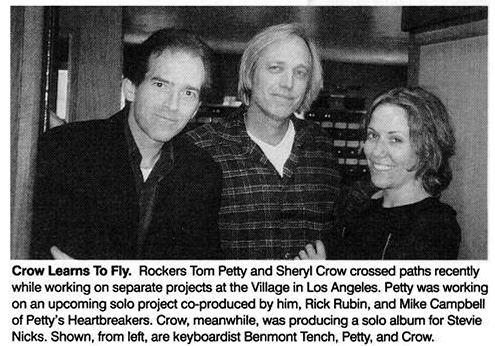 Rockers Tom Petty and Sheryl Crow crossed paths recently while working on separate projects at the Village in Los Angeles. Petty was working on an upcoming solo project co-produced by him, Rick Rubin, and Mike Campbell of Petty's Heartbreakers. Crow, meanwhile, was producing a solo album for Stevie Nicks. Shown, from left, are keyboardist Benmont Tench, Petty, and Crow.